The Rosetta spacecraft’s lander, Philae, safely landed on the surface of a comet just before midnight eastern time on Thursday, setting a space history first. Scientists are now waiting anxiously for the probe to send back more data and pictures. Here’s one of the first images that was beamed back — it’s just part of a full panoramic. You can see the lander’s three feet in the lower left of the photo. Below are more photos that were released at a press conference on Friday. In this picture, scientists have drawn the craft at its suspected orientation. It’s not sitting parallel to the surface as was the hope, researchers told reporters. 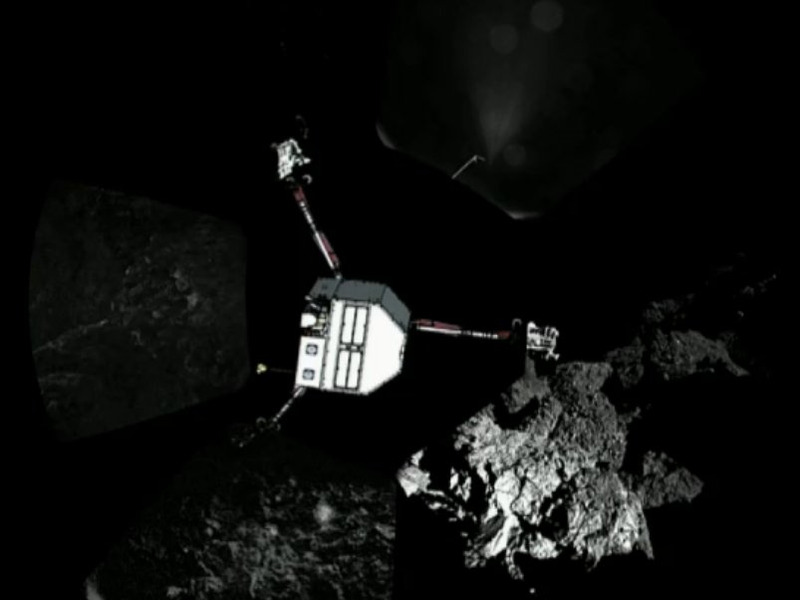 The mission to land a probe on the surface of comet has been a decade in the making. 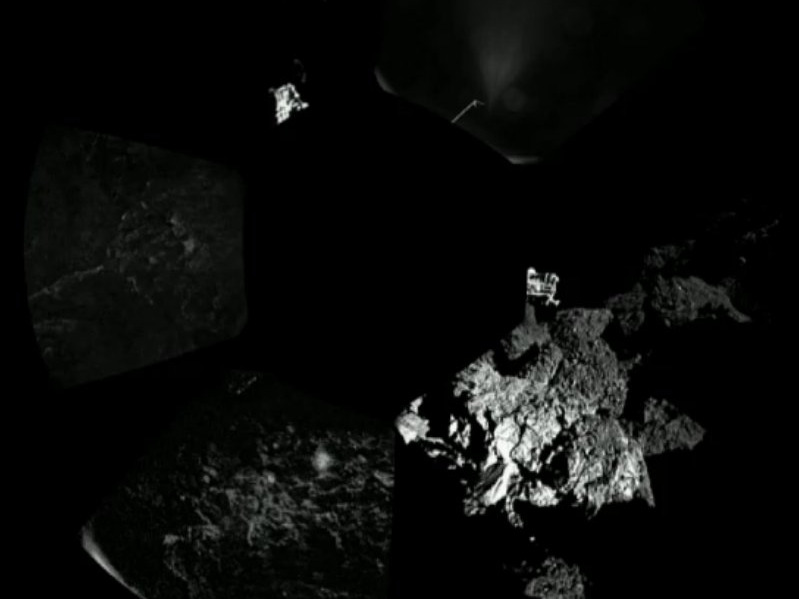 After a 10-year journey, the Rosetta Spacecraft became the first-ever craft to rendezvous with a comet in August. 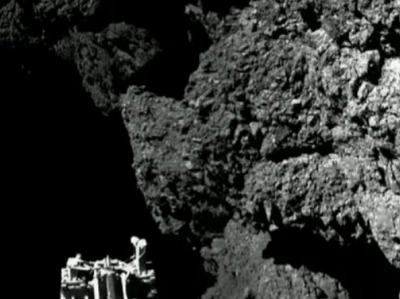 The Philae lander also hitched a ride on the spacecraft, and was deployed on Thursday. 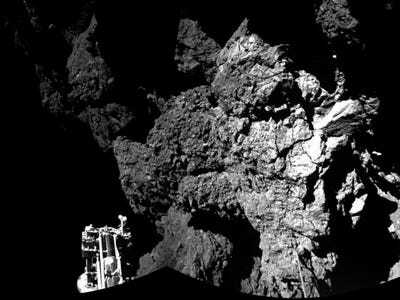 The probe made a seven-hour descent toward the surface of comet 67P/Churyumox-Gerasimenko. 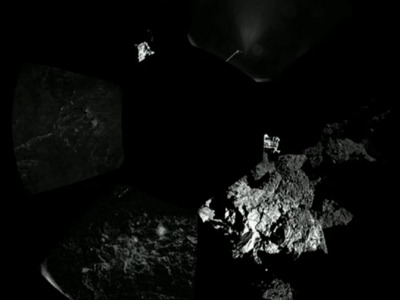 There was a slight hiccup on landing — the harpoon that is meant to secure the probe to the comet failed to fire — but scientists don’t think Philae is in danger of bouncing off — which means we can look forward to tons more photos.